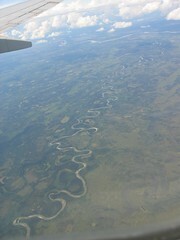 from the plane. alaska is so wild and interesting. there are some more pics over on flickr if you’d like to look – including one of mt. mckinley from the airplane. pretty spectacular. overall, a good time was had. i gained five pounds (no exercise, plus ben’s mom’s cooking and chocolate lying around the house equals…). but mostly, i’m going to be a while in adjusting from staying up until 1,2, or 3 am and ben’s going to have a hard time adjusting from staying up until 3,5, or 7 am. that’s what happens when twilight doesn’t come until midnight. if i’ve the energy, i’ll tell you about some great yarn i got tomorrow. if not, you’ll have to wait a bit longer. it may not be jet lag (1 hr difference) but the time lag is coming down hard. i’m going to bed. This entry was posted in the fam by cosymakes. Bookmark the permalink. That photo totally reminds me of David James Duncan’s novel The River Why. Have you read it? You’d love it. Glad you and Ben are back safe and sound! Thanks for all your Alaska stories. I’ve been once, but in August, so haven’t experienced the midnight sun.